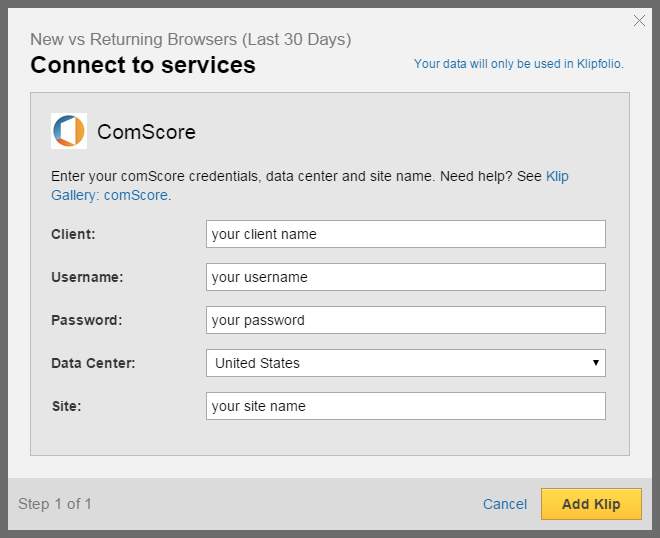 Klip Gallery: comScore – How can we help you today? comScore is a leading internet technology company that measures what people do as they navigate the digital world - and turns that information into insights and actions. Always have fresh insight on your website by monitoring your top 5 exit pages. Compare visits and bounced visits over the past 30 days. Track your average page views per visit and compare it to last month. Monitor the average vist duration for your site over the past 30 days. Delve into the details of your referrers by clicking on each Entry Type (past 30 days). Discover whether your website is generally being used by new browsers or returning browsers over the past 30 days. Add a comScore Klip from the Gallery to your Dashboard. In the comScore dialog box, you are asked for your comScore login information, Data Center and Site. Enter your comScore login information. Select your Data Center from the drop-down list. To find your site, login to comScore Digital Analytix. In comScore, navigate to the top left corner of the page. Under Site, copy the name of your site and paste it into Klipfolio.